Outlander Central: Graham McTavish Reveals "Muddy Madness" on Outlander Set! 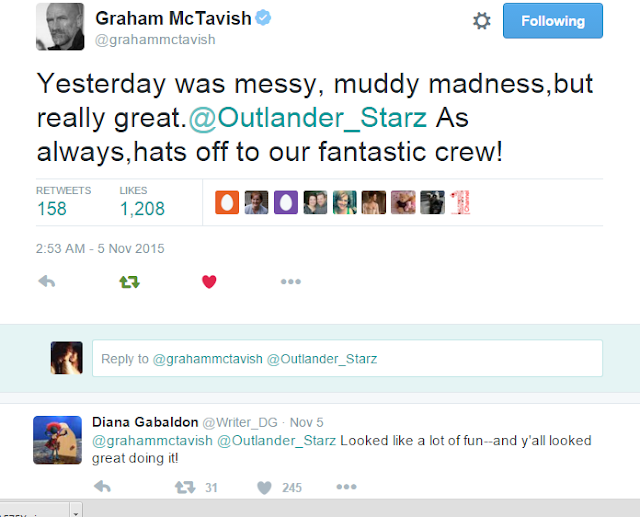 Graham McTavish Reveals "Muddy Madness" on Outlander Set! THE Scots actor, who plays Dougal MacKenzie in the hit show, has been keeping fans updated on what's been going on on-set. OUTLANDER star Graham McTavish has taken to Twitter to discuss the progress of filming for the show's much anticipated second season. The cast and crew have been hard at work on Season 2, filming at a number of locations in Scotland. 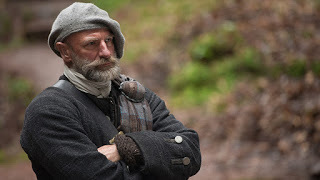 And McTavish, who plays Dougal MacKenzie in the hit show, has been keeping fans updated on what's been going on on-set. The actor tweeted: "Yesterday was messy, muddy madness, but really great. @Outlander_Starz As always, hats off to our fantastic crew!" McTavish has regularly posted on social media to quench fans' thirst during this Droughtlander. 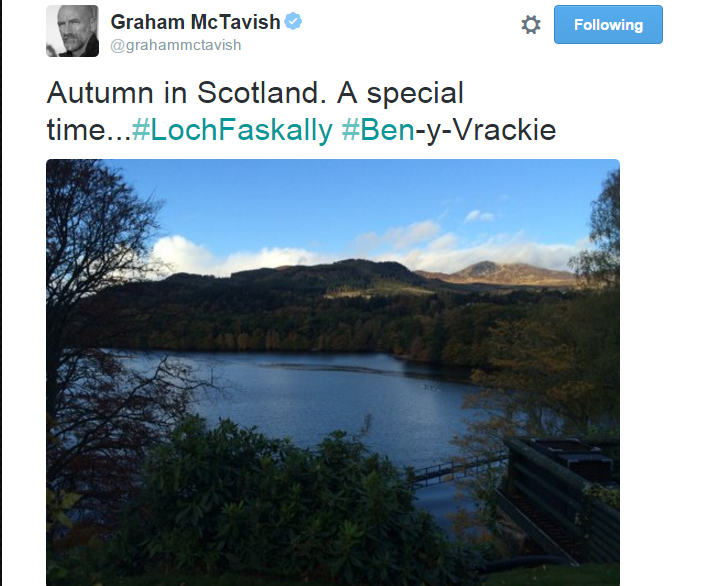 Last month, he tweeted a stunning photo of the autumn landscape from Loch Faskally in Perthshire. The show's executive producer Ron D. Moore also opened up recently about the importance of using Scotland as a film location. He revealed the production team quickly settled on Scotland as they wanted to "take advantage" of the landscape and facilities. In an interview with the BBC, Ron said: "I was pretty sure from the very beginning that to do the show right you would want to shoot it in Scotland, take advantage of the landscape and locations that were available to us here. "In the very early days there were some conversations with the studio about 'do you want to look at New Zealand or look around the world and different places for tax reasons or financial breaks?' but we kind of quickly just settled on Scotland. "We took a first scouting trip here very early in the process and it just became apparent that this was the logical place to do it." "It was a creative decision that married up with the financial decision. There was a generous, relatively new tax credit in the UK, everyone in the United Kingdom that we were able to take advantage of. "When you're looking to go film something like this in a certain location, you're looking for variety of things. There's the currency exchange, the depth of the labour pool dedicated to the film industry. "There's facilities, there's accessibility and Scotland had all of the components to make the show here."